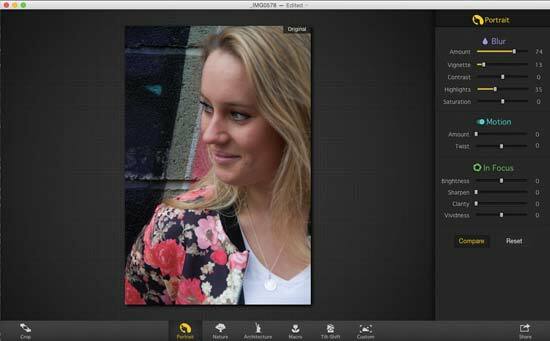 The Focus Pro 2 software from MacPhun is available to users of Mac computers and promises to give you the effects of using different lenses and techniques to alter the look of your photographs. There are two versions of the Focus software, a cheaper standard version which you can buy for £7.99, or the Focus Pro version which is available for £28.99 and is the version we're reviewing here. There are a few notable differences - the Pro version can open raw format files, can be used as a plugin for other programs and has some more advanced features. 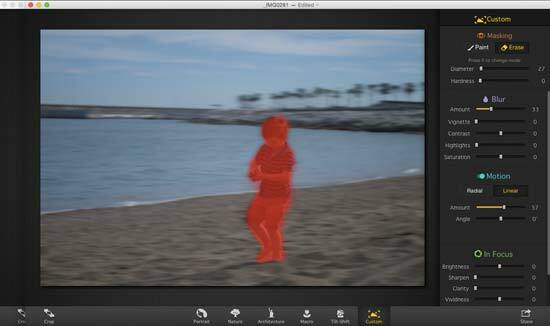 You can download the Focus 2 Pro software directly from MacPhun's website. Before you buy, you can trial the software for 15 days, which is highly recommended as you'll be able to learn how to use it and see whether you like it before committing to spending the money. Once downloaded, simply drag the software's icon into your Applications folder to install. When you open the software for the first time, you can choose to start your trial, or you can input the activation code if you have paid for the software. 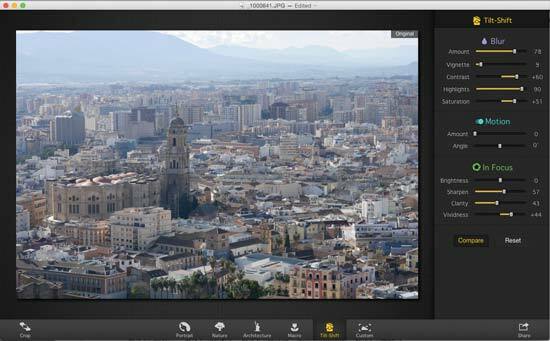 The first time you open the software you'll also be prompted to install the software as an add on to any other compatible Mac programs you may have, such as Photoshop CC, Photoshop Elements, Aperture and so on. You don't have to install them all, but you can always install them at a later date if you choose to. 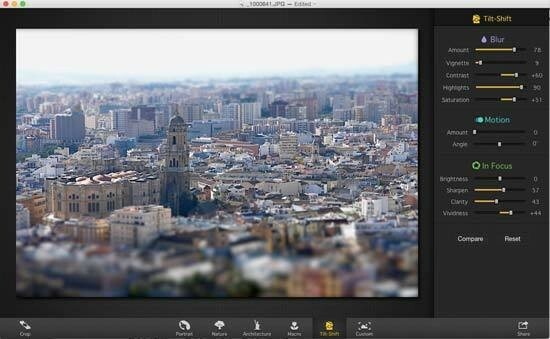 As with other MacPhun software, it is primarily designed with basic functionality in mind, and therefore it doesn't take too long to get to know how the software works. To open an image, you can either browse to a folder on your computer, or you can simply drag a file into the Focus 2 workspace - which is useful if you're using some kind of organisation software, such as Adobe Bridge or just have the files open on your desktop or in the Mac Finder. Once you've opened an image, you'll see the different options which are presented to you along the bottom of the screen. You can choose from a number of different presets depending on the subject of the photograph you're trying to alter and you'll find the following options; Portrait, Nature, Architecture, Macro, Tilt Shift and Custom - it's a good idea to choose the last option if something doesn't have a completely standard shape. Each of the presets works in a slightly different way to help you select the focus point of your image. If you choose Portrait, you'll see a circular selection tool, which you can manipulate by dragging the points around the circle. There are two circles, with everything within the inner circle will be the most in focus, while those in the second circle will be slightly less sharp and everything outside of both circles will fall completely out of focus. You can adjust the size of the circles, or even change it to a more ovular shape, depending on your subject. If you choose Tilt Shift, you will be presented with lines which go across the image. These can be changed to be horizontal or vertical, again, depending on what the subject is. You can change the size of the lines again so that more or less of the subject is within them, and therefore more or less in focus. Choosing the Custom mode allows you a lot more flexibility, but takes slightly longer to get right. With this selected, you simply draw around the subject that you want to be in focus, using a brush tool. If you want to refine the edges of your selection, you can select an erase tool. It's also possible to change the size of both brushes to help you get a more accurate selection. Whichever selection preset you choose, some settings will be made automatically to the picture, but you've then got the option to fine tune these settings in the tab on the right hand side of the window. 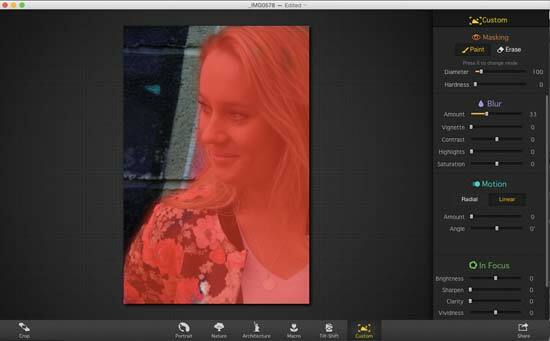 For instance, you can control the strength of the blur, add a vignette, or up the saturation. It's worth experimenting with the sliders until you get the look you want - and again this will vary depending on the subject you're working with. An interesting option here is to add a Motion Blur effect, which will give your shot the appearance of using the panning method to capture it. 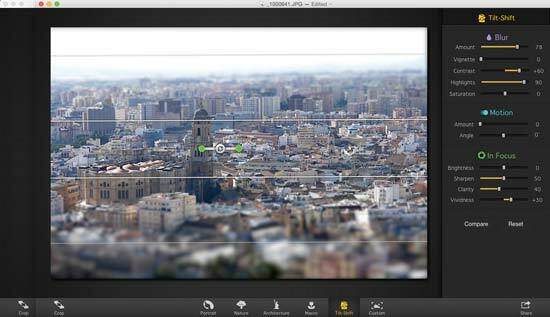 You can also change the way that the in-focus area looks, by altering Sharpness, Brightness, Clarity and Vividness. That's not to say however that this software offers a complete package in itself if you're interested in photo editing - you will still need something else, such as Photoshop, to complete other and more in-depth editing tasks. Any time that you want to compare your edits to how the original image looked you can click on the Compare button at the bottom of the tab on the right hand side of the screen. If you hold this down you'll see how the original image looked - letting go again will reveal how the edits looked. Unlike with some of the other MacPhun software packages, you can't view images side by side though. Once you're happy with the edits you have made, you can then press the Export icon in the bottom right hand corner of the program and choose to save the image as an image file (such as JPEG), choose another piece of software to open the file in, or share to social networking sites (like Flickr, Facebook or Twitter) and email. Handily, you can also save a file as a .focus file, meaning you can save the progress of the file and come back to work on it later. 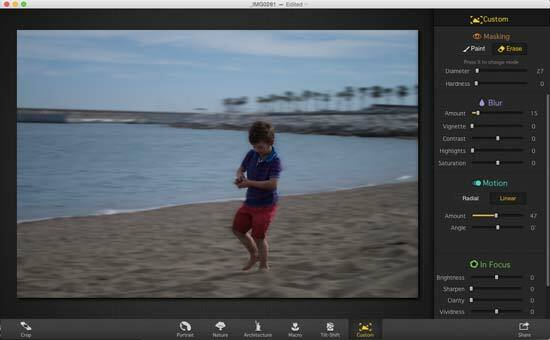 If you've opted to use Focus2 as a plugin in for other software, that's very easy to use too. If you're using Photoshop CC, you simply open the image you want to work on, and navigate to Filter > MacPhun Software > Focus 2 Pro. From here, the Focus 2 Pro window will open, and you can make all the same changes as described above. Once you're happy with what you've done, just press the Accept button in the bottom left hand corner of the screen and you'll be taken back to the Photoshop screen.